MOTOWN: THE MUSICAL is coming to Philadelphia to tell the story of music mogul Berry Gordy Jr and the legendary careers he launched as a record producer. The show is jammed packed with hit after hit from artists such as The Temptations, The Jackson 5 and The Supremes. Jarran Muse talks to Phindie about the show and preparing for his role as Marvin Gaye. 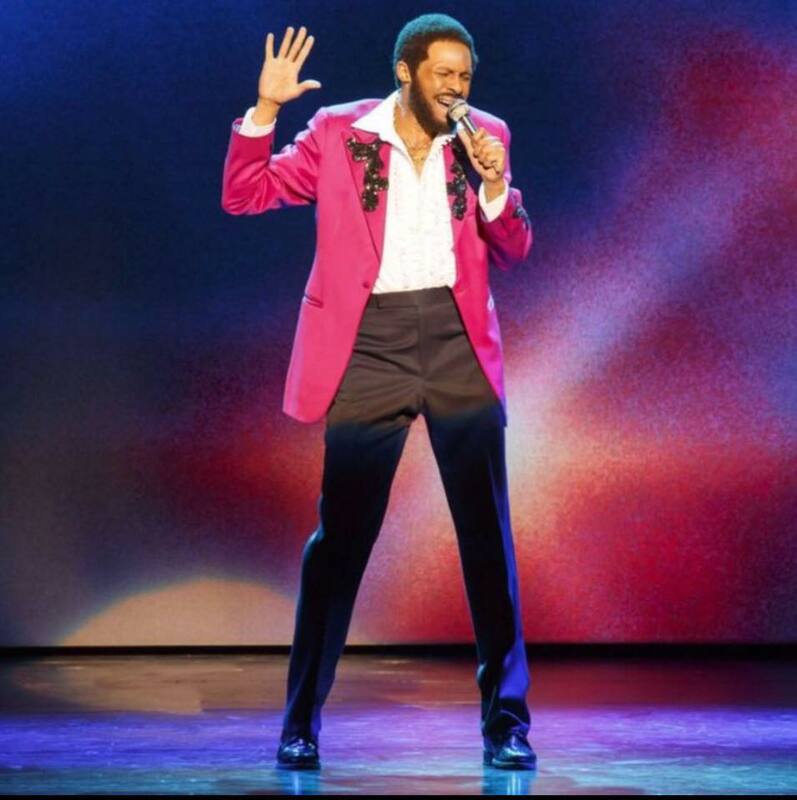 Jarran Muse as Marvin Gaye in MOTOWN: THE MUSICAL. Photo by Joan Marcus. Debra Danese: You will be playing Marvin Gaye in Motown The Musical. How did you prepare to take on the role of such a legendary artist? Jarran Muse: I was able to prepare by reading different books and watching interviews and concerts on the internet. I am happy our generation has the wonderful “Youtube University” available at the click of a mouse. The biggest piece of information that helped me was having the living legend himself, Berry Gordy, who was also Marvin’s brother-in-law, be with us. He shared in detail as much as we wanted to know in the one-on-one sessions we had throughout the rehearsal process. DD: What did you learn about Marvin Gaye that you did not know before playing him in the show? JM: I didn’t know Marvin was as shy as he was in real life. He didn’t want to be a pop star. He wanted to sing ballads and be a crooner like Como and Sinatra. I also didn’t know that Marvin’s first wife was Anna Gordy, the sister of Berry Gordy. She was significantly older than him, which made sense, after reading about his parental issues. DD: You also starred in the Broadway production of Motown. How does the touring production compare to that? JM: The only difference between doing a show on Broadway and doing a tour is that the theaters are usually much smaller in NYC since there isn’t much space in the concrete jungle. On Broadway, you go to work and you go home when your work day is finished. On tour, you travel with, live with, and work with the same company seven days a week. There isn’t a lot of escaping or alone time to have. I love traveling! This being my 6th tour should tell you I really enjoy what I do day in and day out. DD: Who is your favorite Motown group or artist? Why? JM: Marvin Gaye is, and always will be, my favorite Motown artist. I respect him for defying the boundaries of his artistry. He was willing to give everything up just to get his message out, in hopes of awakening the minds of mankind. I must note that I am a huge fan of Stevie Wonder and I don’t think much explanation is needed to vouch for the musical genius. DD: You are a Jersey native and have ties to Philadelphia. What can you tell us about your time in Philadelphia? JM: Yes, I am Jersey Strong and proud to be a native Jersey Boy. I was born and raised closer to NYC, but I spent time at The University of the Arts in Philly. I had a nice time and made some life- long friends, but I wasn’t focused and couldn’t really fit in. Philly is where I had my first apartment and my first credit card! DD: What were you professional ambitions as a college student in Philadelphia? JM: Initially, I attended UArts as a dance major, with aspirations to be in a major dance company like Alvin Ailey; be a backup dancer for a major pop artist; or dance in the chorus of a Broadway show. I quickly realized that acting and voice classes for non- majors only lasted about a semester worth of electives, and I knew I was studying the wrong discipline. Fortunately, I was able to do the school musical, which was reserved for the dance majors. My mentors saw my talent and guided me in the right direction. I’m glad they did! Six National/International tours and three Broadway shows later proves I was destined to do this.